The town of Fairfax is a good stopping point on the way to Point Reyes or beautiful Alpine Lake. 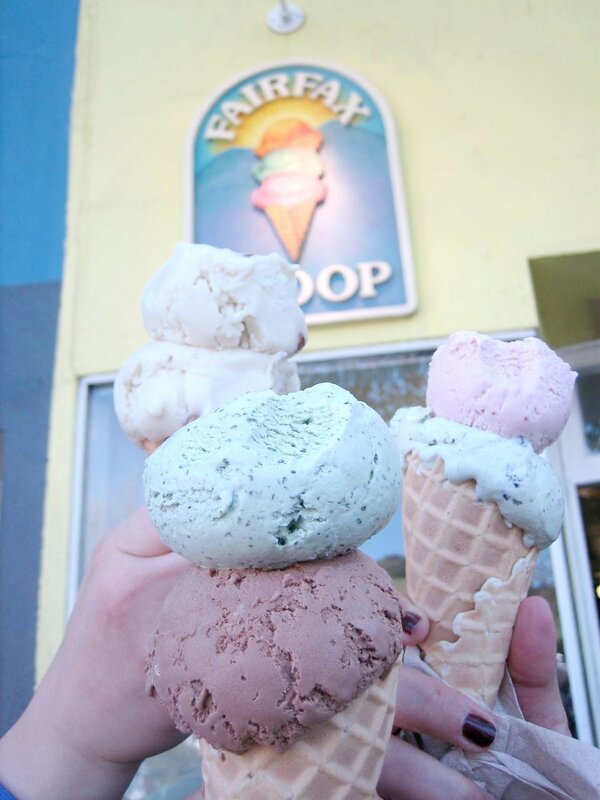 Fairfax Scoop is a small ice cream shop that makes its own flavors with ingredients from local farms and dairies. The cones are freshly made good and the ice cream is natural. The draw that it's a local hangout with friendly service, house made cones, lots of kids and dogs hanging around outside. They even have a step stool running the length of the ice cream freezer so the little ones can look into the case and pick out their flavor. Everyone inside the store and out was spending a leisurely sunny afternoon in their neighborhood. We had Meyer Lemon, Green Tea, Strawberry, Chocolate and Honey Lavender Vanilla.